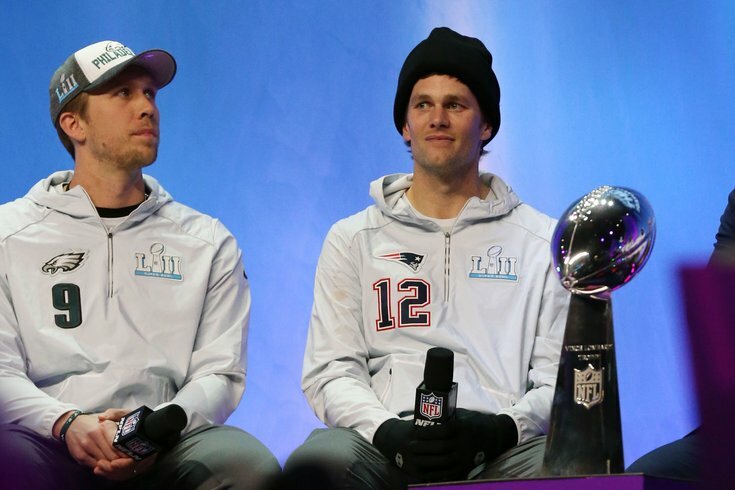 Philadelphia Eagles quarterback Nick Foles and New England Patriots quarterback Tom Brady during Super Bowl LII Opening Night. The Eagles and Patriots are playing this week. Nick Foles and Tom Brady are starting. Yes, it's preseason. But when Lane Johnson and the first team get their reps in during the first quarter up in Foxboro, it won't feel like it. "They say it's preseason but anytime you get to play a team like that it brings out the best," the Pro Bowl tackle said at training camp Tuesday. "You're playing, that's what football should be. It's a competitive sport and that's why it's so great." With so many Eagles-Patriots storylines to keep track of seven months after Philadelphia's historic 41-33 upset win in Super Bowl LII, one can't help but focus on the Foles-Brady dynamic. In April, we wrote about how Brady had not yet reached out in any way to congratulate Foles on besting him in Minneapolis. Not much has changed. "We both have a lot going on in our lives, in time," Foles said in his classic good-guy, conciliatory tone. "We practiced with the Patriots a few years ago and I got to chat with Tom and he's a great guy. Everyone makes a really big deal about it but it's not really big deal at all. I've talked to him before. He's a guy I have always looked up to. You have to admire someone who's one of the greatest ever and still going strong." The reigning Super Bowl MVP and 41-year-old four-time MVP will each take the field, likely briefly, in the mostly meaningless second preseason game, a 7 p.m. kickoff on NBC10. The fans will be thinking about the Super Bowl, no doubt, and Johnson expects Foles' welcome to be slightly warmer than his — as Johnson was one of the Birds' biggest trash talkers and originator of the 2017 Eagles' under dog moniker as we know it. "His will be pretty good," Johnson joked. "I' not sure how mine will be... I think I'll get a lot of loud applause. It will be really fun."